In Social Style terms, Lord Sugar is often used as the typical example of the Driving Style. This is borne out when profiling him. 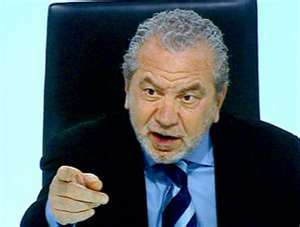 Lord Sugar (AMS) is high on the “tell assertive” axis, with strong eye contact, a direct approach to communication and a tendency to tell you what he thinks, rather than ask what you think. His verbal communication is relatively fast, and the voice is used to emphasise key points, often in combination with hand gestures, such as finger pointing. Generally, tell assertive people are relatively higher energy in their body language, in comparison with more ask assertive types. When we focus on the responsiveness axis, we see that AMS is towards the Task rather than People side. This is evidenced by relatively smaller size of gestures, a more monosyllabic vocal style and a tendency to get right down to business without the need to “get to know you” first. This combination is called the “driving” style, and AMS shares it with Margaret Thatcher. The Driving Style has a need for results. They like to have options, are willing to accept risks and want to move quickly. They also need to have the final say in decisions. In relationships they may appear uncommunicative, independent and competitive. Drivers seldom feel the need to share personal motives or feelings. They tend to initiate action and like to provide direction. This is part of their nature to seek control over their environment. Be timely in all things.